The University of Sydney has launched an ‘Immersive Learning Laboratory’ containing what it claims to be the largest number of virtual reality devices in an Australian education institution. The lab, which is housed within the Faculty of Engineering and Information Technologies, is home to 26 Oculus Rift headsets and a new suite of high-powered PCs to support their use. “Virtual reality technology has revolutionised education opportunities by allowing students to experience and interact with new and diverse environments. For example, many environments in which professional engineers and scientists work are restricted to students, due to safety and logistical constraints,” explained the lab’s project team lead and lecturer in Humanitarian Engineering Dr Jacqueline Thomas. This semester, 12 academics from the University’s faculties of Engineering and Information Technologies, Science, Arts and Social Sciences, and the Sydney School of Architecture, Design and Planning are using the lab for teaching. More than 700 hundred students are expected to experience virtual reality in the lab over this semester. Current immersive experiences on offer include 360-degree video of village life in Niger to help students can to apply engineering skills to humanitarian problems; 3D models of reefs in the Great Barrier Reef for marine biology classes, and a real-time simulation of the night sky being used by astronomy students. A number of Australian universities are taking advantage of virtual reality as tool for education. In May, the University of Newcastle announced that its School of Nursing & Midwifery would be using Samsung GearVR and HTC Vive headsets to run a simulation of a delivery room, presenting midwifery students with an emergency neonatal resuscitation scene. “New graduates may find transitioning from performing a neonatal resuscitation in an educational setting to a real-world emergency room an overwhelming shift, which is exactly why we designed the program to bridge that gap,” said Midwifery lecturer and project leader, Jessica Williams at the time. 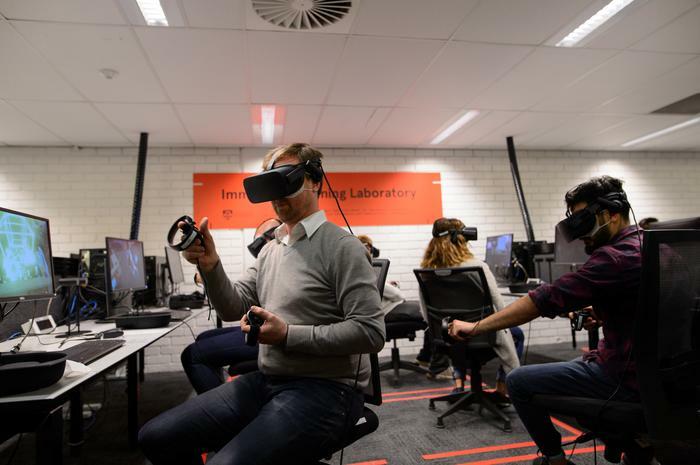 Virtual reality based training programs have been delivered at UNSW’s School of Mining Engineering for almost 10 years, giving students an immersive experience of what it’s like to work underground.